With the help and support of our Ambassadors, currently 89 in 76 countries, involvement in celebrating World Animal Day (4 October) continues to grow at an astonishing rate. From Australia to Zimbabwe, and all countries in-between, this special day was celebrated in a huge variety of ways, irrespective of nationality, religion, faith or political ideology. World Animal Day unites the animal welfare movement, mobilising it into a global force to make the world a better place for all animals. In Egypt, an end to the barbaric killing of stray animals was achieved by SPARE led by its founder Amina Abaza. This amazing accomplishment marks historical progress in the society’s ongoing fight to protect the country’s animals. 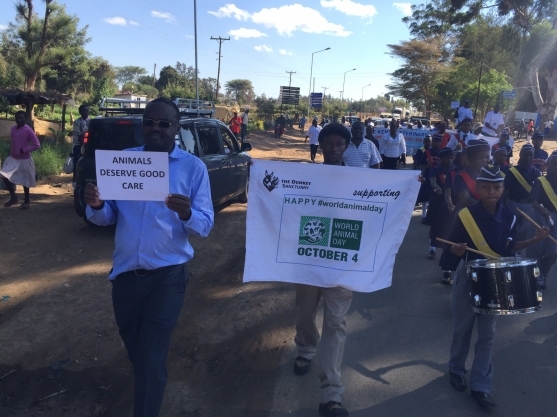 In Nairobi, Kenya, the KVA organised a march to raise awareness of World Animal Day and its Mission. World Animal Day’s Poet in Residence, Susan Richardson, wrote a special poem for World Animal Day 2015. 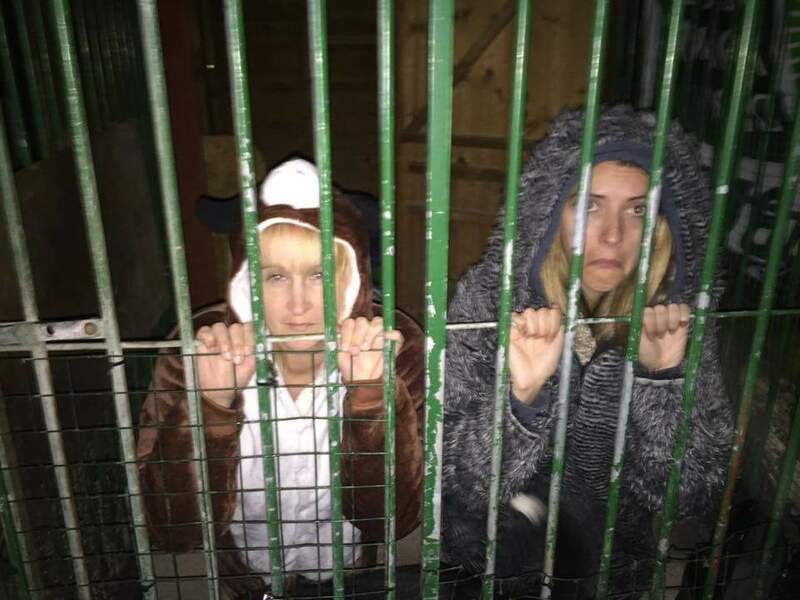 In Latchington, UK, volunteers of Angel Watch Rescue & Rehome participated in a 24 hour Kennel Lock-in – no luxuries, they lived exactly as the dogs do while they wait for a new home. 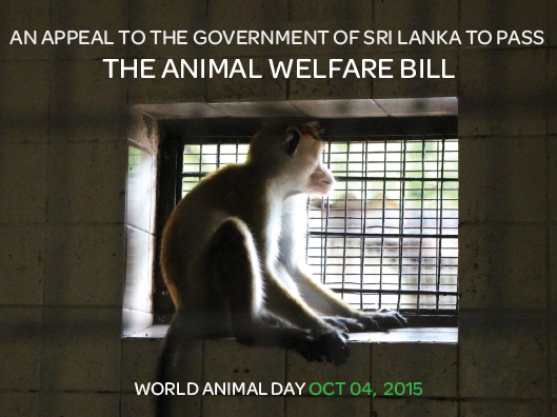 In Sri Lanka, The Otara Foundation, supported by other animal welfare organisations, used World Animal Day to encourage policymakers, parliamentarians and the President to pass a long overdue Animal Welfare Bill. 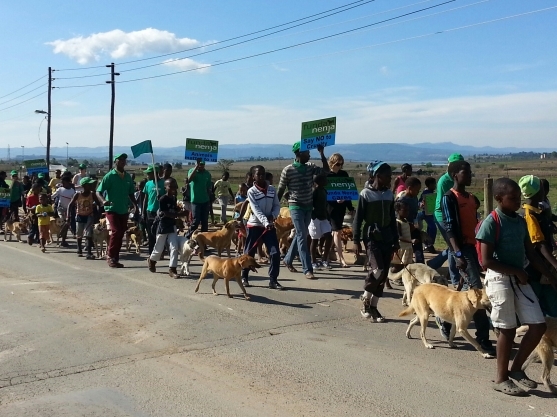 In Funda Nenga, South Africa, people marched with their dogs through the township of Mpophomeni to raise awareness of World Animal Day. 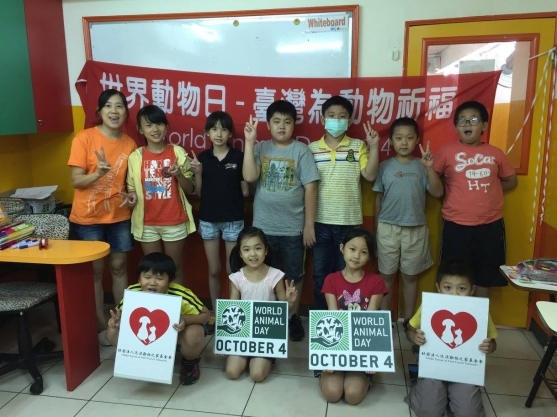 In Taipei, Taiwan, a number of events were organised by the ‘Help Save a Pet Fund ‘including a TV programme to raise awareness of World Animal Day and its mission and talks about animal welfare were presented to schoolchildren. 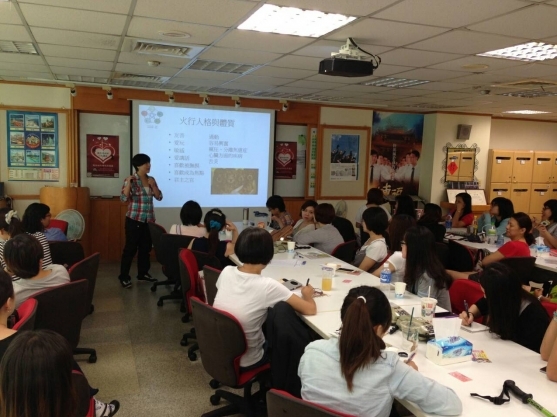 Also in Taipei, the team at Pet Friends Alliance celebrated this important day by hosting a responsible pet ownership workshop. 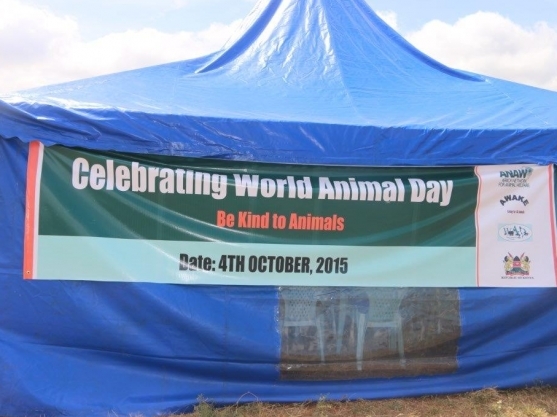 A World Animal Day fair was held during which government officials and animal welfare groups signed a pledge calling for a zero euthanasia policy for abandoned animals. Hundreds of people attended the event and activities included music, performances, and a photo gallery of animals seeking new homes. In Nairobi, Kenya, the Africa Network for Animal Welfare celebrated the day by holding free animal health clinics to provide rabies vaccinations, deworming, grooming and humane education in two venues within the suburbs of Nairobi. A total of 126 dogs and 48 cats were treated. 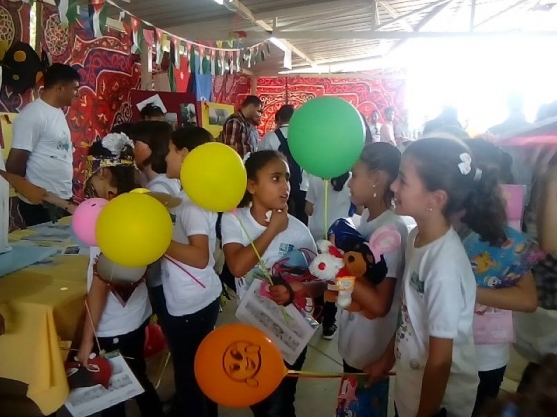 In Jordan, SPANA welcomed HRH Sana Asem to their World Animal Day event which included a concert by local schoolchildren, display of projects undertaken by schools and other groups to promote improved standards of animal welfare, police dog and horse displays, and free treatment of animals. 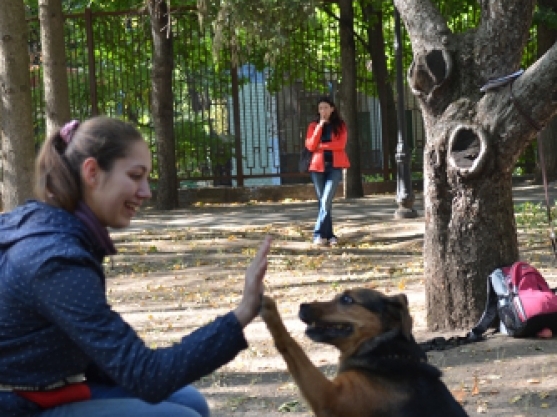 In Kharkov, Ukraine, ‘Together SPA’ held an event in the city’s central park to raise public awareness of animal issues such as the benefits of microchipping your pet and being a responsible pet owner. They also sold books about animals, held a dog training workshop and a painting workshop for kids. All the people who stopped by were able to meet a selection of dogs and cats that are available for rehoming at the society’s shelter. Also in Ukraine, a country where microchipping has yet to be introduced, a seminar was held for vets to educate them about the benefits of encouraging owners to microchip their pets. 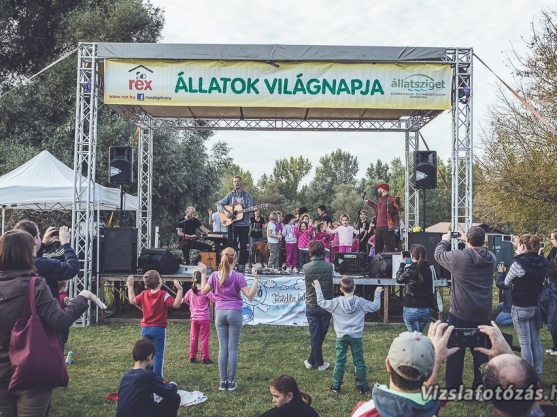 In Budapest, Hungary, the Rex Foundation organised a full range of entertainment suitable for the entire family including concerts, competitions, a photo contest and a presentation ceremony to recognise the work of organisations and individuals who strive to protect animals. 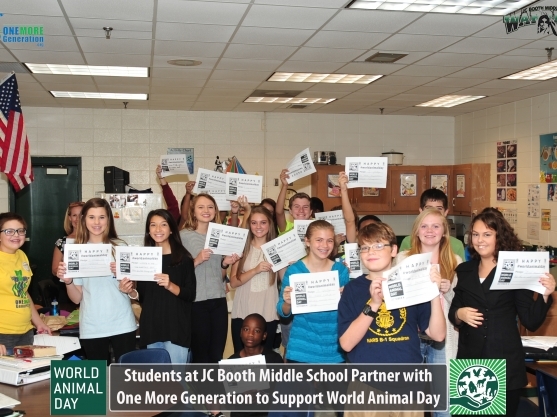 In Atlanta, USA, Carter and Olivia Ries, founders of ‘One More Generation’, asked students of JC Booth Middle School to sign a pledge to show they care about animals. Each student wrote their own pledge which featured on the World Animal Day Facebook page, along with pledges made by people from throughout the world who are standing up for the rights of animals. In Uganda, The Big Fix conducted a five-day free veterinary field clinic in the remote villages of Gulu District. 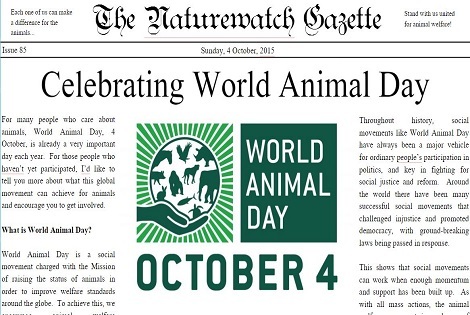 These events held in celebration of World Animal Day 2015 are but a handful! More can be found on www.worldanimalday.org.uk in countries such as Venezuela, Costa Rica, Portugal, Bulgaria, Croatia, Australia, Malta, Finland, Pakistan, Brazil, USA, South Africa, Australia, India, Hong Kong, Sweden, Singapore, France, Nepal, Serbia, Turkey, United Kingdom, Mexico, Honduras, Uganda, Cyprus, Tanzania, Egypt, Malaysia and Panama. In addition, simply hundreds of Animal Blessing Services were held around the globe and even more World Animal Day events can be found via a Google search. More information: About World Animal Day can be found on www.worldanimalday.org.uk where you can also meet our team of 89 Ambassadors representing 76 countries. If you are not already part of this global movement for animals: Please consider getting involved next year. If you know of a World Animal Day event that’s not been submitted to the website for 2015: Please ask the organiser to Sign Up as a member – it’s very quick and easy. Once approved, you can then Login and add event(s).